In the previous story I rediscovered my old partial 7710 Push-Along Passenger Steam Train locomotive, released in 1980. Let’s take a closer look at it and especially its stickers. Feel free to shudder at the STAMP, but do note the logo on the train, VR. Apparently LEGO used to localize its sticker options, because instead of the usual DB (German Deutsche Bundesbahn, later Deutsche Bahn) you see in many PR shots, VR is short for Valtionrautatiet aka the Finnish State Railways. VR is still called VR today, although now privatized and with a new logo since 1985. I must have used the correct local variant back then (my old coach doors have DB stickers, though, I think the set had localized stickers only for the locomotive). 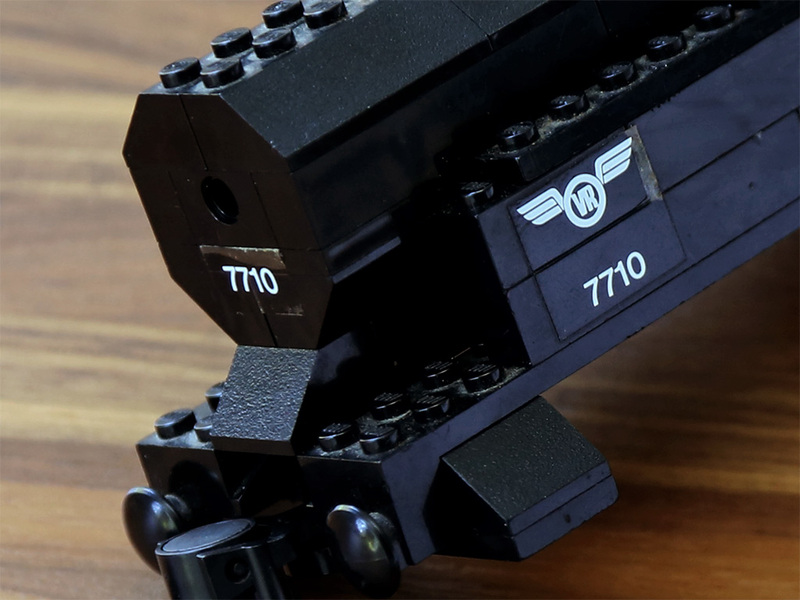 You can see the old VR logo in real world use here in the 1960s and in early 1980s – LEGO had an accurate sticker, considering 7710 Push-Along Passenger Steam Train came out in 1980. Peeron actually has a photo of the sticker sheet for both 7710 Push-Along Passenger Steam Train and 7740 Inter-City Passenger Train, showing those logo options. The smaller 7710 sticker sheet seems to include all the Nordic country railways and the German railways logo, the larger 7740 sticker sheet adds more European and American logos too (update: JopieK clarifies the logo countries). I had forgotten all about this great little detail. LEGO used to be so local in those early days, when their world was smaller. But when we built our first train together with my son some years ago, the 7897 Passenger Train (released 2006), there was only the arrowed LEGO Trains logo included. A variation of this logo was, by the way, included in the earlier localized train sticker sheets too. Studying the LEGO Trains history, the earliest example of localized train stickers I came across was the 727 Locomotive (1977), prior to that trains seemed to use either only model numbers on their stickers, or just DB like on 725 Freight Train Set (1974). The first example of any railway logo (DB) I found was 724 12v Diesel Locomotive with Crane Wagon and Tipper Wagon (1972). Of course it is possible some markets shipped with different/localized sticker sheets. For example, the 7710 Push-Along Passenger Steam Train sticker sheet was updated at some point. It seems the change from localized railways logos to a generic one goes back to 1991 and the introduction of the 9V Trains. Mid-1980s trains (last of the regular trains released until 1991) still have e.g. the DB and VR logos, the 1991 ones do not. The generic 1991 logo has continued until this day and still adorns the latest in the LEGO Trains heritage, the 3677 Red Cargo Train (2011). There have been a few LEGO trains under license, though, such as the 10219 Maersk Train. A very good notice indeed 😉 They used to have almost every european railway company, but no US one 😉 I have reproduced all of them so I have been busy with getting the logo’s digitized etc. B.t.w. we notice that most people prefer the german stickers: DB. Those are the stickers that LEGO typically also used in their instructions. Thank you for the comment! Yes, I too have “grown up” associating the DB sticker with LEGO Trains. I think it was only much later, during my dark ages, that I learned its meaning.